Irritating Clichés People Hate at Work #INFOGRAPHIC - Your journey to a new career. Anyone looking to enter the modern workplace should know that the old way of doing business is just that – old. Used-up phrases and cliches are out of style, and this article points out the worst offenders. 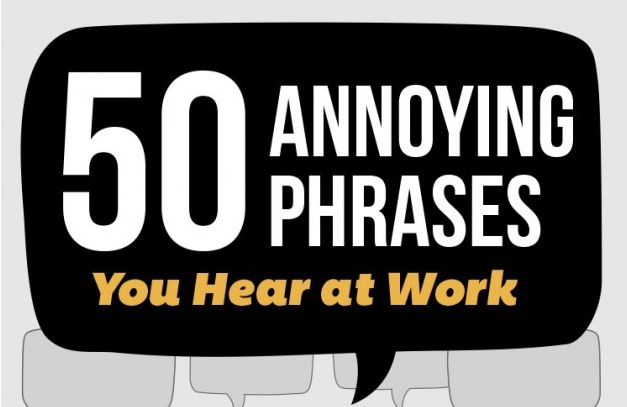 So let the “50 Annoying Phrases You Hear At Work” slowly fade away, now that you know what they are. Take a look at the poster and you will remember them all, and remember to be yourself at work so you can get ahead instead behind the times!